To kick off the holidays, we had a family movie night on Sunday. We dimmed the lights, I lit the five votive candles that spell out P-E-A-C-E on the mantel, and we all snuggled up for the A Muppet Christmas Carol. A few minutes into the movie, one of the candles blew out. A few minutes later, another. Usually, those votives last a few hours. But by the time the 85-minute movie was over, only the “P” remained lit. “Hmmm, I’m guessing Papa wants us to know he’s watching, too,” I told the boys. After the kids were in bed, the house was quiet; Brad sat down to write out some holiday cards for his staff and I sat down at the laptop. Suddenly, a sound in the living room startled us: it was the Beatles, singing “Love Me Do.” Just then, the “P” candle on the mantel went out. Brad laughed, opened his arms wide as if about to give someone a hug, and said, “Ahhh. Hi, Pete!” In the three years since my dad died, the Beatles – one of my dad’s fave groups (we even sang Hey Jude at his memorial service) – have randomly begun playing on our iPod’s docking station, oftentimes in the middle of the night, so many times we’ve lost count. There’s no telling what song will play. But the candle trick that night made this serenade extra impressive, and we took that music as a direct message from my dad: “Love, love me do. You know I love you. I’ll always be true. So pleeeeeeeease…love me do.” We do, Dad, we do. Even though I talk to spirits and angels for a living, trusting what I hear from my own loved ones is still difficult. If I’m busy or distracted, I don’t always notice them. And sometimes, I wonder if I’m just imagining what I want to hear if I’m missing my dad, grandparents or others. So to get these little earthly signs is so reassuring. Your loved ones on the Other Side are likely doing the same for you, going out of their way to let you know they’re around. I’ve had so many readings lately during which parents, grandparents, siblings and friends have come through to let their people here know that the signs they’re seeing are really from them, just to let them know they’re loved and not alone. We can explain these things away, or we can trust that flutter of our hearts when something odd or serendipitous happens that feels Heaven-sent. Notice how you FEEL when these things happen; if you get the chills, your heart leaps, you get teary-eyed or spooked (not their intended outcome, by the way! ), acknowledge your loved ones so they know it’s working and that you want to continue feeling blessed by their presence. So, what should you watch for? Playing with electricity. The spirits of our loved ones are all energy, all vibration. So manipulating the energetic properties of electricity seems to be a fairly easy way for them to send us a message: the lights flicker, a device randomly turns on or off, a machine works without being plugged in, etc. Sending signals. Another way they play with energy is by intercepting or playing with a communication signal. For instance, you hear static on the radio, a song or message you both loved plays at an unexpected place or time, the door bell rings repeatedly (with no one at the door), or your cell phone does something wild (I’ve had multiple people tell me they’ve received silent voice mails from a deceased loved one’s number shortly after their passing). Hanging out in nature. Spirits seem to love working with messengers who have the gift of flight: birds (especially those that stand out, like bright red cardinals), butterflies and dragonflies are most common. But anything in nature that had/has special significance for you can be sent to signify you’re not alone. Years ago, I had a reading with my friend Suzanne, and my grandpa told me to watch for “strange birds” as a sign he was around. The next day, I saw a PEACOCK strutting through my office parking lot! I’ll never forget it! Making magic. 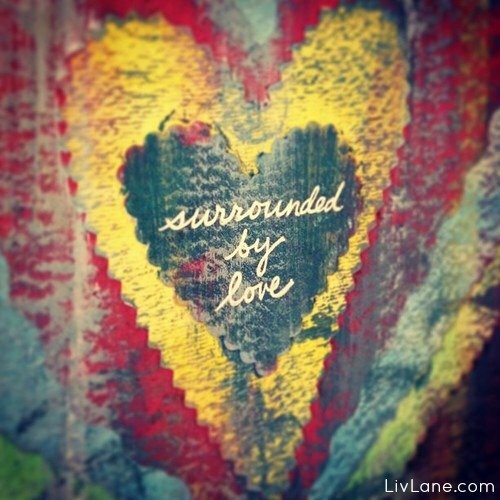 When they can, our loved ones delight in orchestrating little bits of synchronicity for us. It’s those impossible-to-plan moments when we say, “I know _________ had something to do with this!” For instance, check out the gift I got from my Nana last month! Sending earth angels. When our loved ones can’t get through to us, they sometimes send someone else into our lives to be a blessing or unknowingly deliver a message. This story, when “George M” watched over us, is a fun example. Visiting in dreams. When a loved one who’s crossed over appears in a dream, and you vividly recall it after waking, trust that you’ve had a heavenly visitor. When we sleep, we separate from the limitations of our mind, and don’t question or doubt a visitor from another dimension. These reassuring messages from the Great Beyond come when we least expect it. If you’re watching out your window or staring at your candles longing for some kind of communication, you actually make it harder for them to get through. There’s a difference in our own energy when we’re desperate and down; in that emotional state, we tend to question or totally miss the positive energetic engagement our loved ones are attempting to establish with us. The greatest gift you can give yourself and them is to live fully, to enjoy earthly pleasures and pastimes, while trusting that your loved ones are standing by, visiting often, and dropping heavenly hints whenever the time is right.